After competing in the B Pool at the Sapporo Games four years earlier, WEST GERMANY were thoroughly satisfied with the prospect of facing off against neighboring SWITZERLAND at the Olympiahalle in Innsbruck for the right to play in the top tier of the ice hockey tournament proper for the 1976 Winter Olympic Games. 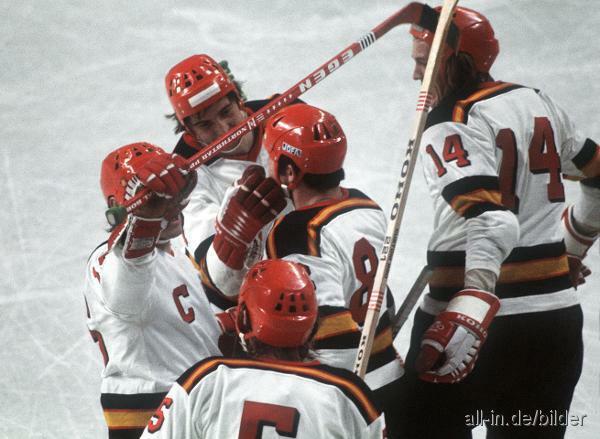 West Germany were enjoying a six-game winning streak at the World Championships and Winter Olympics opposite the Swiss, including the 5-0 triumph by the Bundesrepublik Deutschland over die Schweiz at the 1972 Sapporo Games in Japan four years earlier. Indeed, the Federal Republic of Germany had not bowed to Switzerland since losing 6-1 in the B Pool of the 1965 IIHF World Championships at Pori, Finland. Following the 3-3 draw between the two countries at the 1954 IIHF World Championships in Stockholm, the West Germans had become dominant in the regional rivalry while winning ten of the last eleven contests at the World Championships proper heading into the Olympic clash in the Austrian Alps. 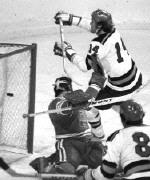 Most recent, of course, had been the decisive 8-3 defeat West Germany had inflicted upon Switzerland on home ice at Munich’s Olympiahalle in the B Pool of the 1975 IIHF World Championships. Nevertheless, the Swiss were hoping that forward WALTER DUERST of HC Davos, the 25-year-old who topped the B Pool in 1975 with eight goals, might help engineer a surprise in the qualification match with the neighboring West Germans. Duerst had also finished as the top scorer for the B Pool in 1975 with a dozen points in seven contests while edging out West Germany Olympic captain ALOIS SCHLODER of EV Landshut (3 go, 8 as) and his titanic Bundesliga teammate, ERICH KUEHNHACKL, as well as Romania standout Doru Tureanu (both 6 go, 4 as). However, neither Duerst nor Switzerland would have much success against their long-time nemesis to the north at Innsbruck. 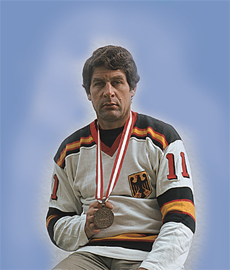 West Germany forward LORENZ FUNK (9), who celebrated Bundesliga titles with EC Bad Tolz (’66) and SC Berlin (’74 and ’76), appeared with the national team at the Winter Olympics three times (’68,’72,’76) and the IIHF World Championships on another thirteen occasions from 1966 thru 1979 … RAINER PHILIPP (8) of Vfl Bad Nauheim watches as EV Landshut center ERICH KUEHNHACKL (14) shoots a fourth goal for West Germany against Switzerland at the Olympiahalle in Innsbruck during the qualification round for the 1976 Winter Olympic Games. Switzerland did manage to stay even with West Germany for a little more than half of the first period in a physical match which saw each team assessed seven minor penalties by the referees GORDON KERR of Canada and AKE HANQVIST of Sweden. But then 28-year-old center LORENZ FUNK of SC Berlin, appearing at the third Winter Olympics of his career, found the back of the net almost eleven and a half minutes in to leave the Swiss trailing as the first intermission arrived at the Olympiahalle. And, shortly, a pair of Blitztore from the West Germans to open the second period quickly left Switzerland staring at a sizeable, three-goal defict. Soon-to-be 36-year-old SC Berlin left wing ERNST KOEPF, who had made his Olympic debut the last time the city of Innsbruck had hosted the Winter Games a dozen years earlier in 1964, converted a feed from his teammate on the 1976 Bundesliga champion, MARTIN HINTERSTOCKER, at the 1:53 mark of the middle frame. It had been the 21-year-old Hinterstocker who had earned an assist on the West Germans’ first goal, as well. Funk then fashioned yet another goal, his second of the Olympic qualification match with the Swiss, unassisted just 24 seconds later to complete a natural hat trick of sorts for the all-Schlittschuhclub Berlin forward line. Kuehnhackl, a native of the Sudetenland region of Czechoslovakia who began his career behind the Iron Curtain with Banik Sokolov in that country’s elite league before joining EV Landshut to start the 1968/69 campaign, added a fourth goal for West Germany four minutes into the third period. Swiss fans at the Olympiahalle in the Austrian Alps finally had something to cheer about halfway thru the final frame when SC Langnau forward JUERG BERGER, just three days shy of his 22nd birthday, scored to spoil the shutout bid. But BOOS of EG Dusseldorf struck again with a little under three and a half minutes remaining to set the final scoreline at 5-1 in favor of Deutschland. Seven in a row for West Germany over their neighbors to the south from Switzerland, then, as SC Berlin and national team trainer XAVER UNSINN’s charges skated triumphantly into the A Pool for the final round of the ice hockey competition at the 1976 Winter Olympics. Altogether, in all contests including international friendlies, etc., winger ERNST KOEPF (11) skated 154 times and scored 83 goals for the national team of the Bundesrepublik Deutschland. Note — SWITZERLAND and WEST GERMANY engaged in two-game, home and away qualification series for the A Pool of the 1965 IIHF World Championships beginning in mid-December of 1964. The Swiss first won away at Augsburg but the West Germans returned the favor in Bern and so a third, winner-take-all match was required — a wild affair in Geneva which the West Germans won 7-6 on a shorthanded goal by ERNST KOEPF of EV Fuessen very late in the third period. The Bundesrepublik Deutschland lost the next qualification series to Norway, though, and would, therefore, meet the Poles once again in the B Pool later that spring. These three qualification games from the 1964/65 season are not included in the numbers for the winning streak discussed in the above article.